What could be more fun (or scarier) than a Nightmare Freddy figure? Look no further than 2016 Funko Five Nights at Freddy's Mystery Minis that also happen to glow in the dark. Shining the spotlight on the Five Nights at Freddy's franchise, the set includes several versions of Freddy and his gang of animatronics. Five Night's at Freddy's, or FNaF for short, puts gamers on their toes while they play as Mike who is in charge of keeping watch of the animatronic group through the night. However, the characters come to life and roam the building waiting to either kill you or end your game with a jump scare, as these things tend to happen when you're playing a survival horror game. Issued by the case in a blind-box format, each of the miniature figures is approximately 2 1/2" tall. 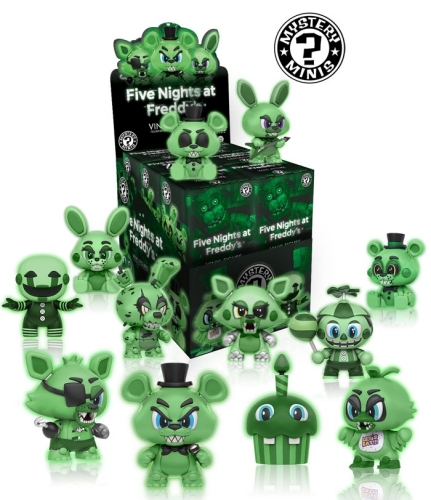 The glow-in-the-dark Funko Five Night's at Freddy's Mystery Minis are packaged alike to help maintain the element of surprise until opened. Fans have a greater chance to find and collect the entire set as there appear to be just 12 minis to track down. However, collectors should keep in mind that each case contains only 12 figures and more than one case might be necessary to complete the set. No announcement for any exclusives has been released at this time and figure rarity will be added when available. It should also be noted that a previous Funko Five Nights at Freddy's Mystery Minis set released with a similar, but not exact, checklist. Making it easy to distinguish, these figures were not glow-in-the-dark. In addition, the Funko Pop Five Nights at Freddy's set offers more FNaF options. Funko Mystery Mini Five Nights At Freddy's GITD Toy Freddie Walmart Exclusive!